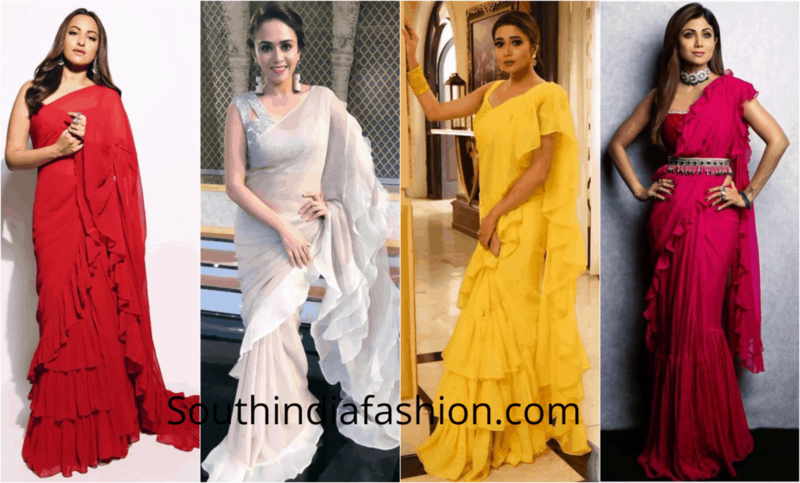 Fashion Trends Ruffle Sarees To Elevate Your Fashion Quotient! There aren’t enough words to describe the versatility of the elegant six yards of magic! Sarees are also undergoing trendy makeovers to upgrade their style quotient and that is how ruffle sarees came into the picture! Ruffle Sarees are playful and chic! 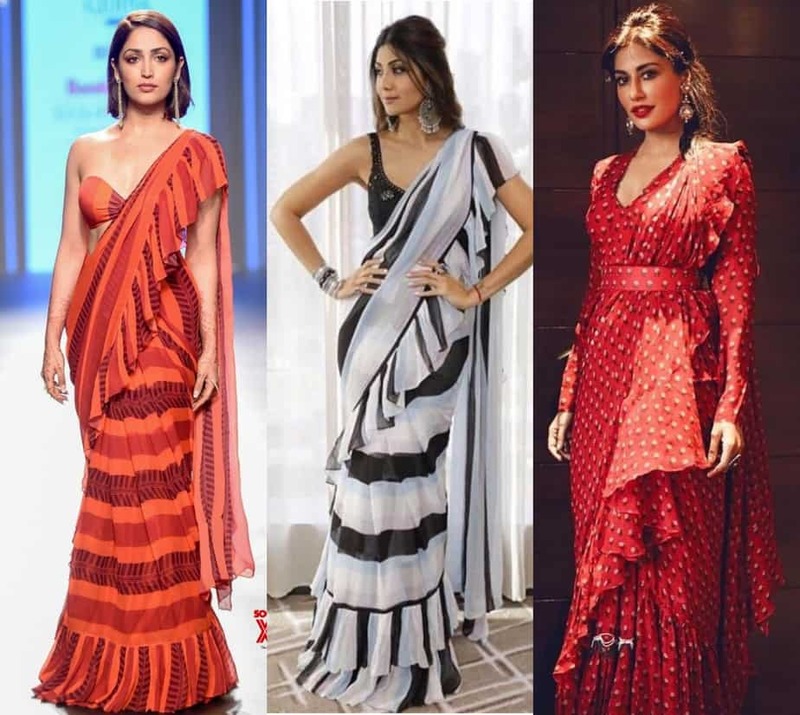 Many Bollywood actresses seem to have experimented this fun trendy saree style off late. 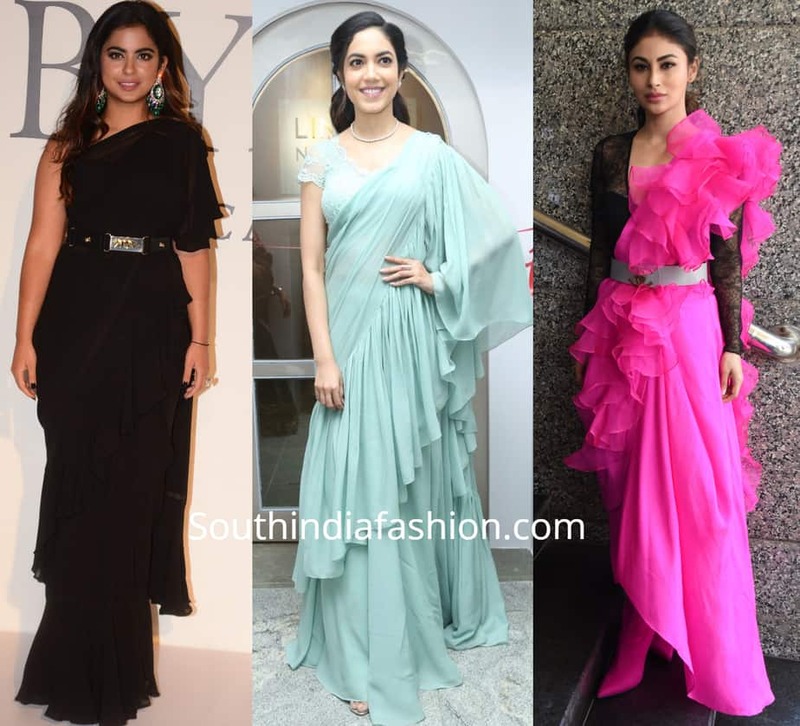 Many Divas like Erica Fernandes, Amala Paul, and Divya Khosla Kumar were too spotted sporting the ruffle sarees. It is a perfect outfit to wear for a cocktail or party. They look gorgeous in almost every color. It gives a unique look as well gives a kick with a modern twist to your saree style. We have established that floral prints are the current trend that you cannot ignore! Floral print by itself is fun and with ruffles, it’s like plenty of playful-vibe. Refreshing ruffle saree in floral prints can never go wrong. From Drashti Dhami to Shilpa Shetty Kundra have rocked these effortlessly! Ruffle saree in plain solid colors can be the safest pick if you are skeptical about pulling it off. From adding a contrast or embellished blouse to adding a quirky belt to it, these trendy sarees are very easy to style. Sonakshi Sinha was spotted recently in this trendy ruffle saree at Kalank’s promotion. Alia Bhatt was recently spotted at Sabyasachi’s anniversary event wearing a lovely paisley printed ruffle sari and she looked gorgeous! 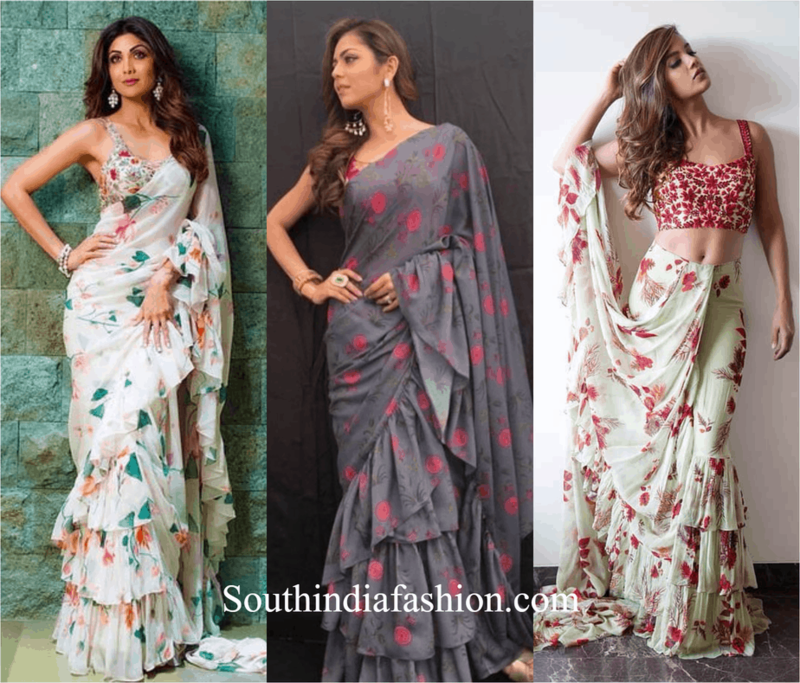 In the past, Shilpa Shetty Kundra and Chitrangadha Singh too flaunted ruffle sarees in various other prints. Stripes or polka dots, they are comfortable and versatile! SHOP PRINTED RUFFLE SARIS ONLINE HERE! Summer’s BFF – Pastels look lavishing in the ruffle style too! Adding to the freshness of the pastels, the ruffles add depth and volume to the look. 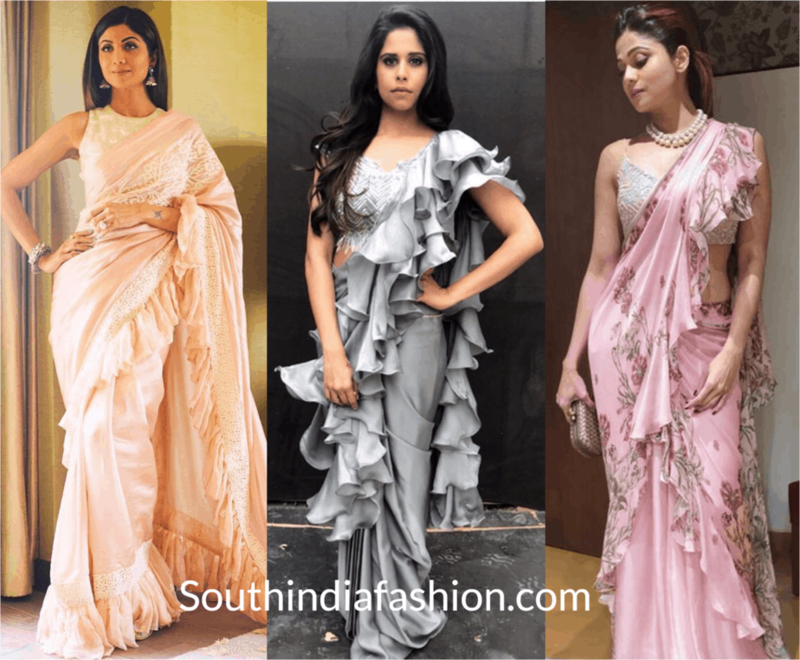 Sai Tamhankar wore a beautiful grey ruffle saree and Shamita Shetty donned a pretty baby pink one. In pastel colors, they compliment your mood and enhance your style statement. Simple ruffles are fun and playful – and, if you add some embellishments to them they turn regal and royal! Designer Arpita Mehta recently launched a collection of embellished ruffle saris and we can’t stop eyeing it! Sonakshi Sinha and Sakshi Dhoni wore these and looked like they were straight out of a ramp show! With subtle sequins and Zardosi work on them, it is something you could totally shop for the upcoming wedding season. Ruffles are delicate and feminine and deserve every bit of space in your wardrobe. Don’t you agree? Shop for some gorgeous Ruffle Sarees online HERE.